DOES THE INTERNET MAKE YOU FEEL INADEQUATE? So when I did something on the Cane Creek Angleset for Spoke Magazines website instead of writing a review or rehashing a press release, I tried to use it as a soapbox to call out another thing I hate, that’s right MTB INTERNET FORUMS AND THEIR USERS. There has never been a time when riders were entirely happy with the numbers in their bike, but with the advent and explosion of the internet in mountain biking, more and more often riders are made to believe the bike they lovingly and desperately threw all their savings into, is totally inadequate. F-ing forums are a big part of this. My advice is to never ever look at them to find answers because they are just full of misinformed opinion and e-engineering based on speculation hewn from one forum user’s quick glance at a grubby low res photo of a bike. By reading this nonsense some people are left with a kind of inadequacy or bicycle hypochondria. Nowhere else is this more prevalent than with head angles. 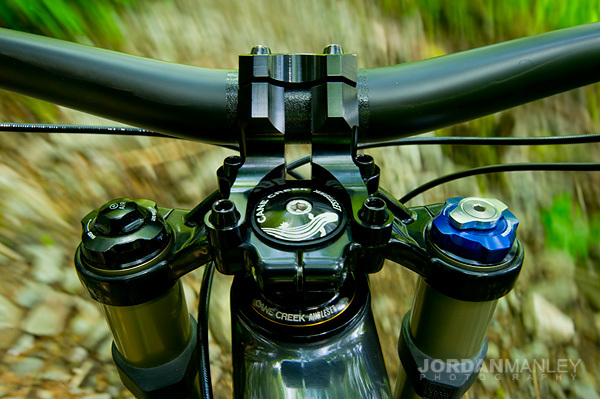 If you have a problem in your brain about the head angle of your frame then Cane Creek has created something to relieve your paranoid anxieties. 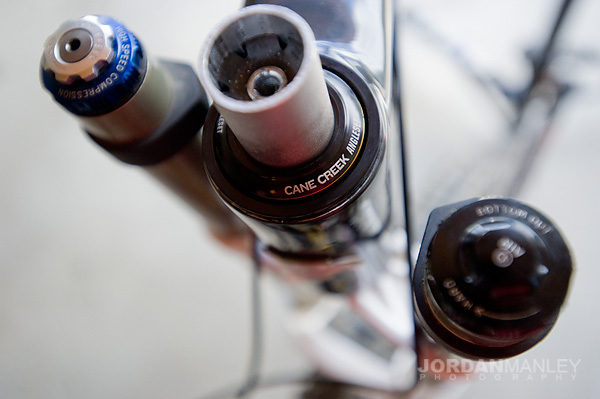 Cane Creek have brought out a new threadless headset that allows you to change the head angle of your mountain bike by up to 1.5°. The new AngleSet is designed to fit any length head tube and is suitable for both tapered (1.125in to 1.5in) and 1.5in head tubes. It offers a choice of seven angles: +/- 0.5°, 1° and 1.5°, plus 0°, in case you want to run a 1.125in fork steerer in a larger head tube but don’t want to change the head angle. Three models will be available from September, all of which are designed for 1.125in fork steerers: ZS49/30 (for 1.5in head tube), ZS49/30 (for tapered head tube with zero stack upper and traditional lower) and ZS56/30 (for tapered head tube with zero stack upper and lower). 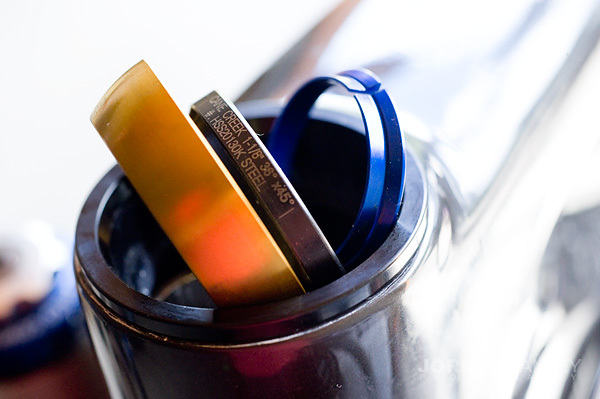 Riders can opt for just one offset option or buy a set including all three lower cups. While riding the V.10.4 I had the chance to imagine that I needed to mess around with the head angle. I didn’t put it to use but this week I knocked out the Angleset and slipped it into my Driver 8 to slacken the angle just a little bit to make it a little bit more race friendly. Simple installation and now I have a 1 degree slacker Driver 8 that really loves to shralp those high speed turns and chatter. I really love this product as it means that companies don’t have to cater to the whims of forum degenerates by welding bolts and twisty creeky rubbish to the head tubes of their beautiful beasts any more. Instead they can supply (or recommend) the Angleset and hey presto! No more extra crap on the bike required. Why should I trust this blog ?